Coronation Drive, formerly known as River Road, is one of the main exits from the city to Brisbane's Volvo-belt, the western suburbs. Being so close to the river has both advantages and disadvantages - for advantages, consider the views and the cool breezes; the main disadvantage is (of course) the possibility of flooding. The 2011 floods saw Coronation Drive closed for a couple of days as water coursed across its surface, but previous floods have left more destruction than that. The 1974 flood levels rose to the first floor of the Regatta Hotel, and I can recall that Coronation Drive traffic was diverted further inland for many months following because authorities were wary of erosion. 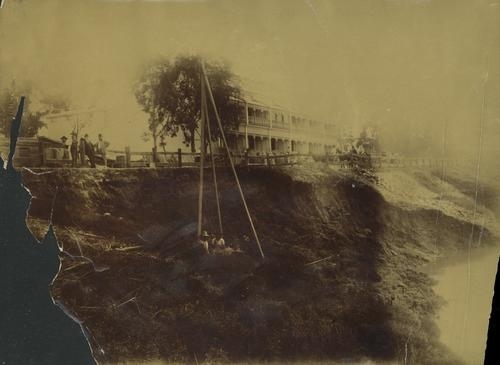 Here is a picture of erosion from even further back, possibly following the 1893 floods. The building in the old photograph is Cook Terrace, named after the builder Joseph Cook, who erected the terraces in the 1890s. Subsequently the building was known as Milton Terrace and Gloralgar Flats, but is now once again known as Cook Terrace. 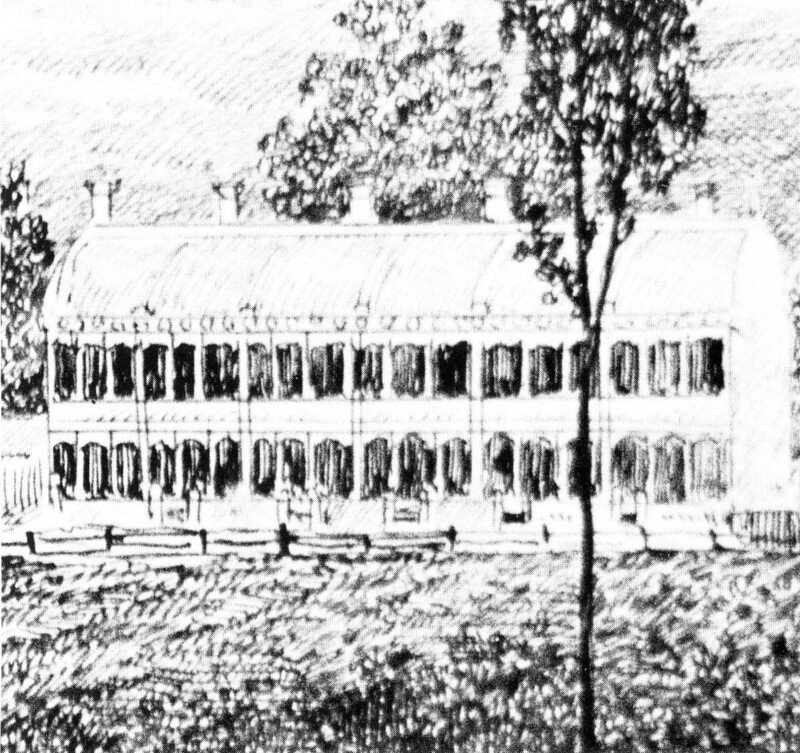 Cook bought the land from John McDougall, who sliced it off his holding at Milton House estate. Here is another flood photo of the area with a dinghy sailing past the roofline of some Milton houses. The caption on the photo says "Milton Cook Terrace ". Ever-alert reader Peter reckons that the photo doesn't include any part of the Cook Terrace building, however. I'm letting him sort that out with the holders of the image. At least it gives an idea of the extent of the flooding of the Brisbane River. 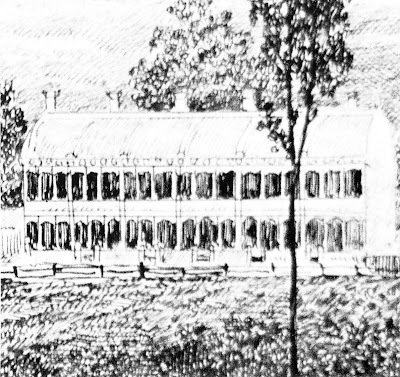 The following sketch was made by Lefevre James Cransone, a Canadian artist, in 1890, and it shows the original form of the building. Originally home to many of Brisbane's professional residents, the building was used by the armed forces during WWII, and then converted to flats afterwards. For many years they were rather unkempt in appearance, but they had a full makeover in 1984. At that time, the interiors were gutted and the building was converted to offices, with a restaurant at the western end. This is still the current layout, and my recent photo is shown below. As far as I am aware, the building was unaffected by the recent flood. I took the photograph after flood waters had receded and the restaurant was operating as normal. The giant fig tree, partially obscured at the far left of the image, and the building itself remain as significant landmarks in this part of the city. EDIT: Click here to see a recent real estate listing for one of the terraces. Absolutely a gorgeous terrace. Was there the top, attic row in the original building? "Between 1895-1905 the parapet was removed and dormer windows instated with a wooden verandah and domed reading room was added as a south wing (to the left of the photo)"